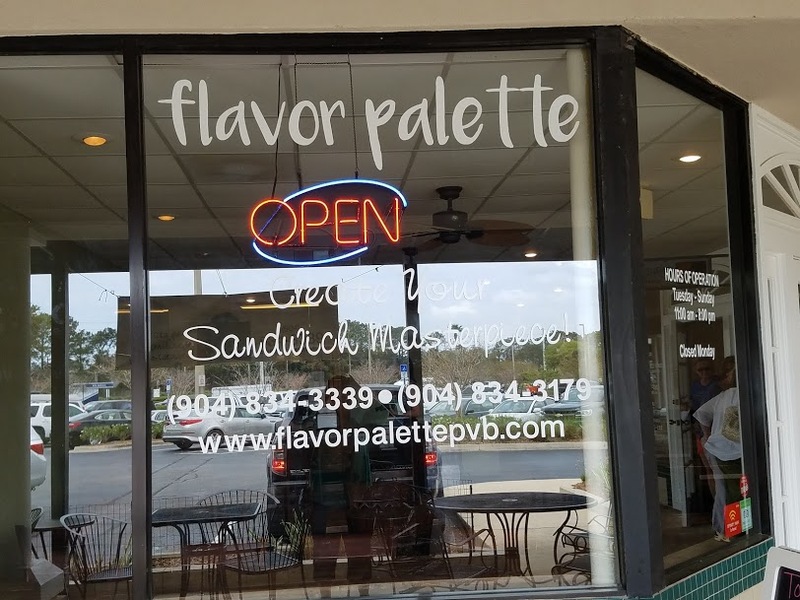 Today was my second visit to Flavor Palette, the first being during the soft opening. 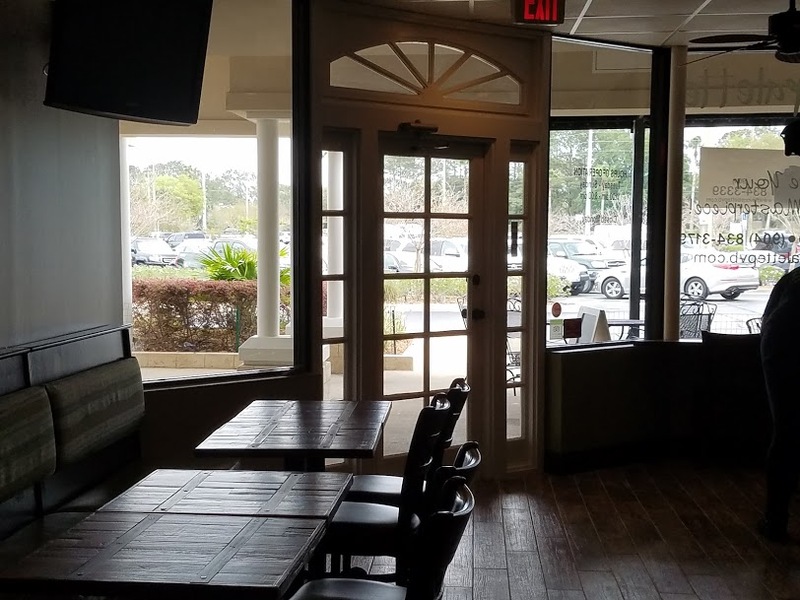 I did not have the opportunity to try any of the many signature sandwiches or salads, but I did get to chat with the Chef owner Tommy McDonough and his wife on that visit. It is clear from the start the drive and passion to present a new and exciting experience to the people who visit is the number one priority here. If your looking for hip, trendy decor, elevator music to fill the void, this is not your place. 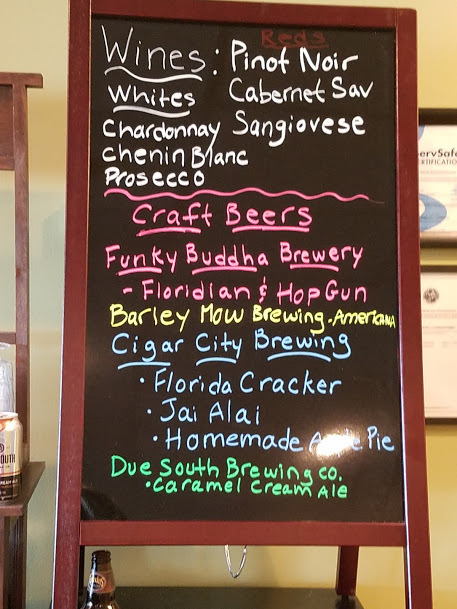 New beer and wine offering. On the other hand, if you want to break away from the sameness of the restaurants that fill the highways and shopping malls this is your spot. 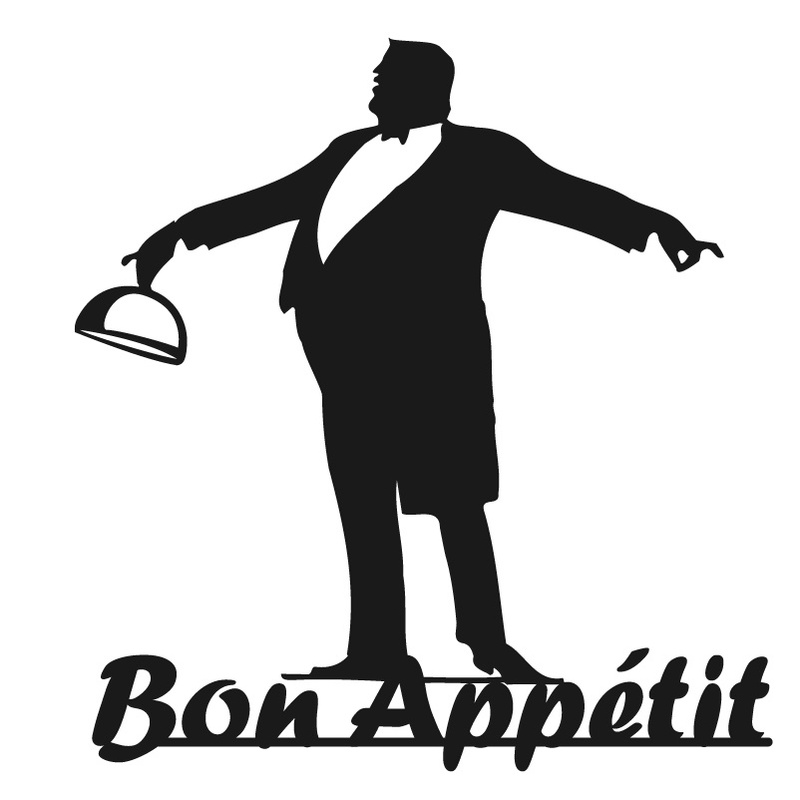 With the focus on international flavors, the menu filled with exoctic offerings such as The Samurian, Moroccan Chicken, Falafel Burger and much more. 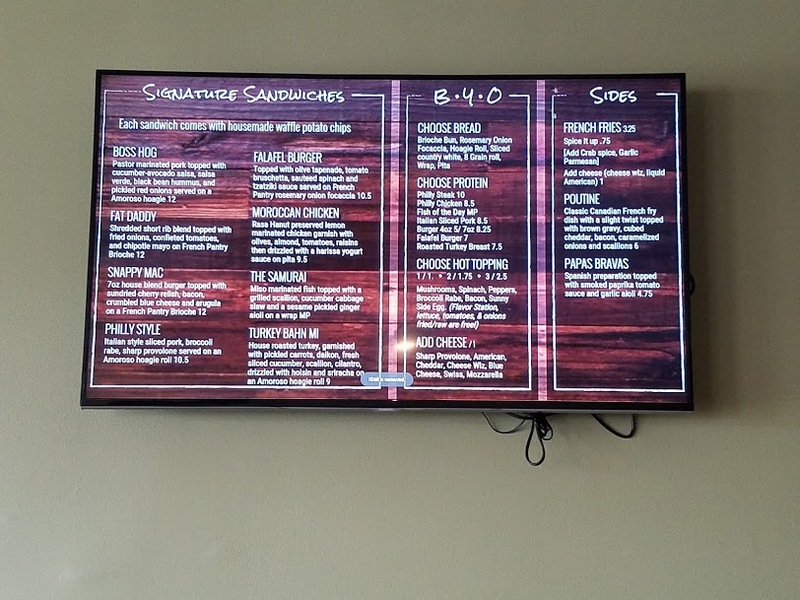 There is a build your own sandwich option, as well as freshly constructed salads. Not you normal french fries the offering here also include Poutine, or Papas Brava’s a Spanish preparation, rounding out the menu Soup made from scratch with fresh vegetables. All breads are from the popular French Pantry. The picnic table seating makes the perfect spot for group meet ups for fun and conversation. Out side seats, weather permitting is always a plus for me. Today I was ready for my adventure into Chef Tommy’s world. 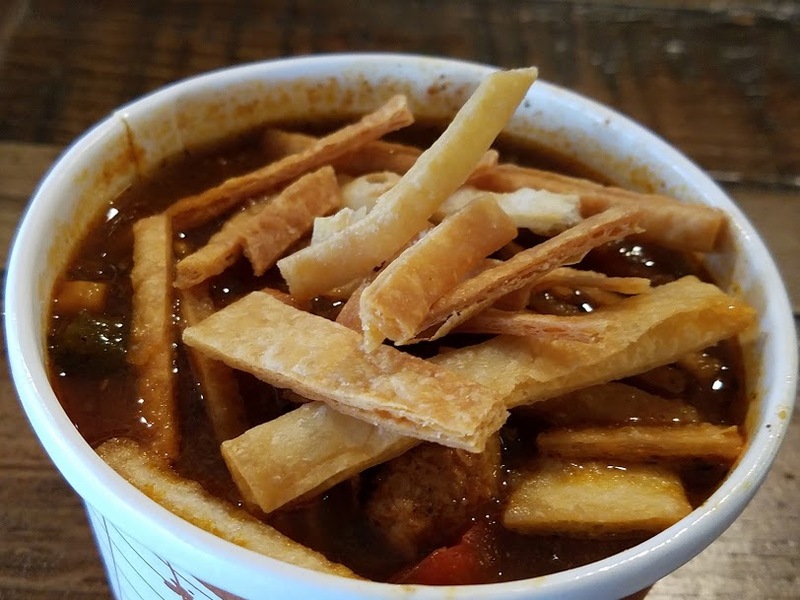 I asked him to make me his favorite offering, and I chose the soup of the day, Southwest Chicken Tortilla. A zesty combination of vegetables, bite sized pieces of chicken, well spiced with fresh cilantro and ample amounts of salt and pepper. Even on a warm day this was a welcomed dish. Chef Tommy did share with me he made this in a pressure cooker. Who knew? My Chef choice sandwich the oversized roast beef with a house made Giardiniera, crunchy pickled veggies, in a white wine and vinegar brine with sliced cheddar. I never would have put this veggie mix on a sandwich, guess that’s why I am not a chef. Loaded with meat on a tasty bun, and a side of flavored au jus for dipping. The brine from the vegetables did that job for me. I was gobsmacked from the flavor. The sandwich was so large I chose to abandon the bread in favor of the meat and vegetable combo, oh and dessert. 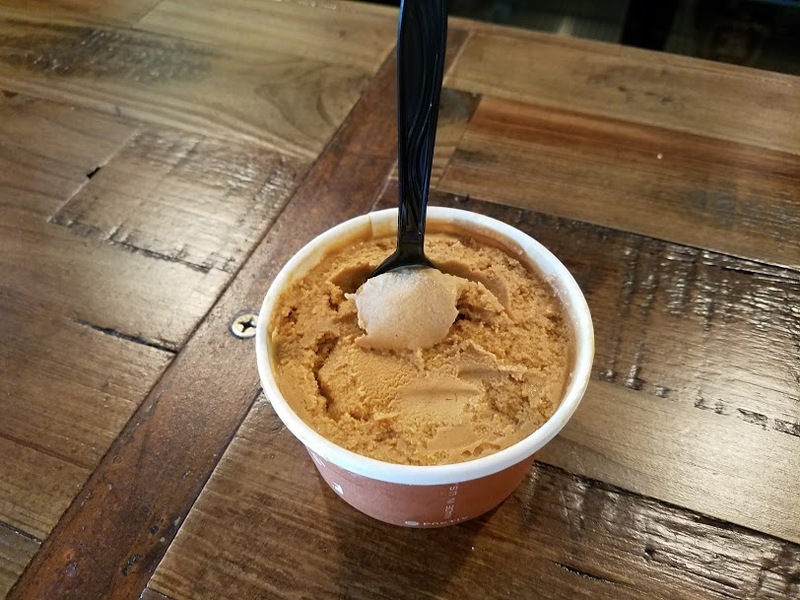 On my first visit I did try the gelato, made from scratch and pack for easy convenience. On that visit I tested the Strawberry/Balsamic. Sweet and Savory all in one dish. This was devoured on the spot. 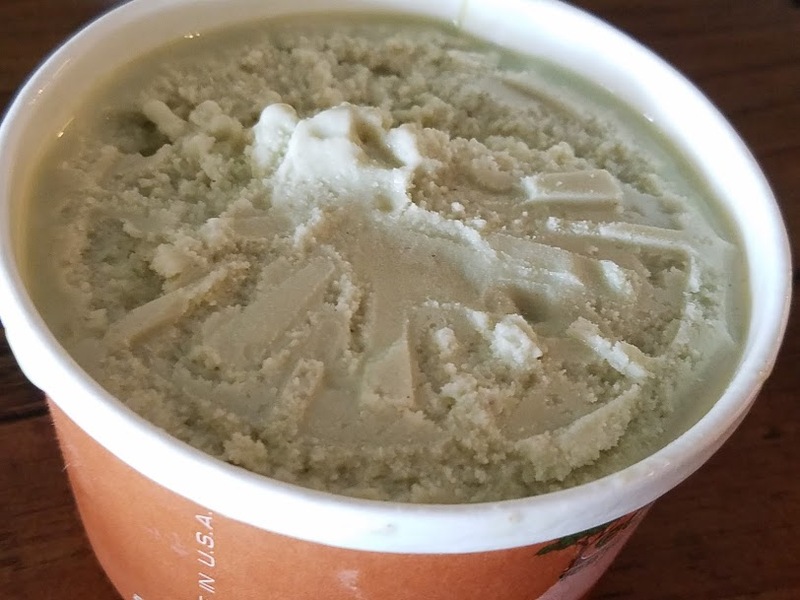 I also chose a Pistachio to go, which sadly, I ate in the car on the way home. My preference the Strawberry. 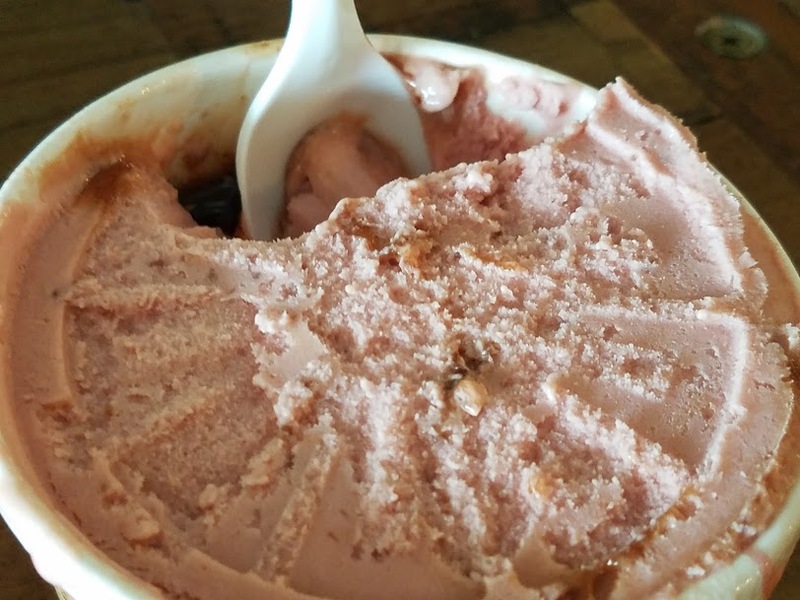 The flavors change on a regular basis and today’s options were heavy on chocolate, which would normally be my choice, but the Jameson Caramel caught my eye. Let’s face it folks I have had chocolate gelato in the past, never, never, Jameson. Experimentation is the first rule, and I was well rewarded. Nice flavor from the Whiskey, but not overpowering caramel rang through. So the take away, a positive and satisfying visit, custom-made for anyone looking for a new and different experience. 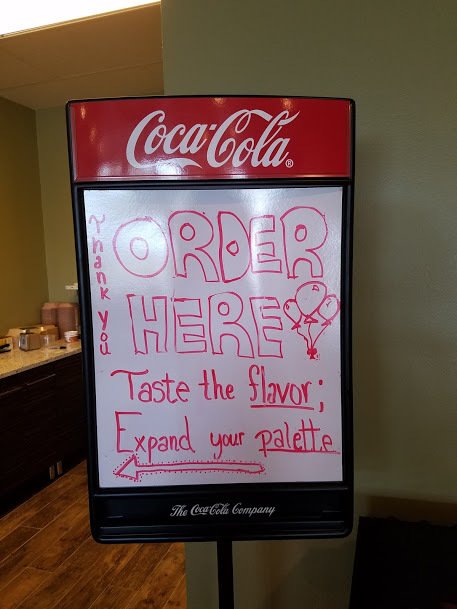 From the comments I have read and heard Flavor Palatte is a welcome addition to the dining or lack of options in the area. Gather the gang, stop in for some killer sandwiches, ice cold local beer, or a chilled glass of wine. Sit in or out the main idea is to share, have fun and enjoy. We were there at the same time you were and had the roast beef sandwich and soup. You nailed the review of both. 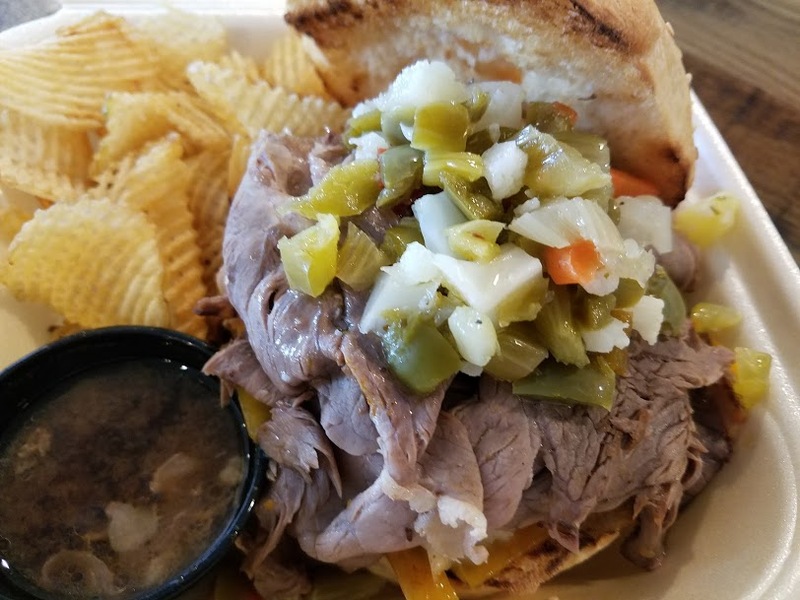 The gardineria on the sandwich is like the Chicago style Italian roast beef sandwich. This was a great version of the sandwich. I was so pleased with the menu Tommy is offering and plan to go back and try the exotic fries. I had no clue about gardineria and was astounded the depth of flavor it added to the sandwich. I hope you keep reading the blog and thank you for the comments.